Historians and theologians alike have long recognized the rallying cries that rested at the heart of the sixteenth-century Protestant Reformation-sola scriptura, solus Christus, sola gratia, sola fide, and soli Deo gloria. Though the context and circumstances of life, the specific struggles or events throughout the church's history may shift, the five declarations that distinguished the Protestant Reformation from other expressions of the Christian faith continue to speak to us today, addressing a wide range of contemporary issues and serving as our great inheritance from those believers who have gone before us. 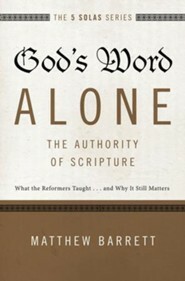 God's Word Alone-The Authority of Scripture is the third in The Five Solas Series, a series designed to help readers understand the historical and biblical context of the five solas and how to live out the relevance of Reformation theology today. 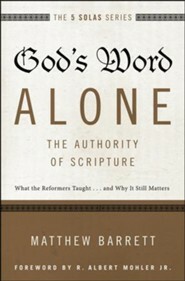 In God's Word Alone-The Authority of Scripture, scholar and pastor Matthew Barrett looks at the historical and biblical roots of the doctrine that Scripture alone is the final and decisive authority for God's people. He examines the development of this theme in the Reformation and traces the crisis that followed resulting in a shift away from the authority of Scripture. 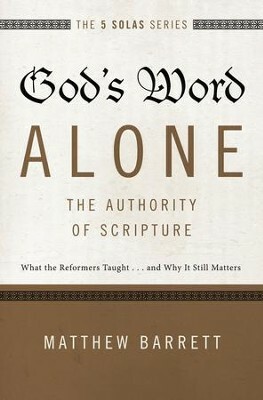 Drawing upon the Trinitarian, covenantal, and salvation-historical themes of Scripture, Barrett demonstrates the need to recover a robust doctrine of Scripture's authority in the face of today's challenges and why a solid doctrinal foundation built on God's Word is the best hope for the future of the church. I'm the author/artist and I want to review God's Word Alone--The Authority of Scripture: What the Reformers Taught...and Why It Still Matters - eBook.